BABY BLUE- this is apparently the color TO GO FOR this summer! Looks great with all white but as well suit so great to all beige shades! 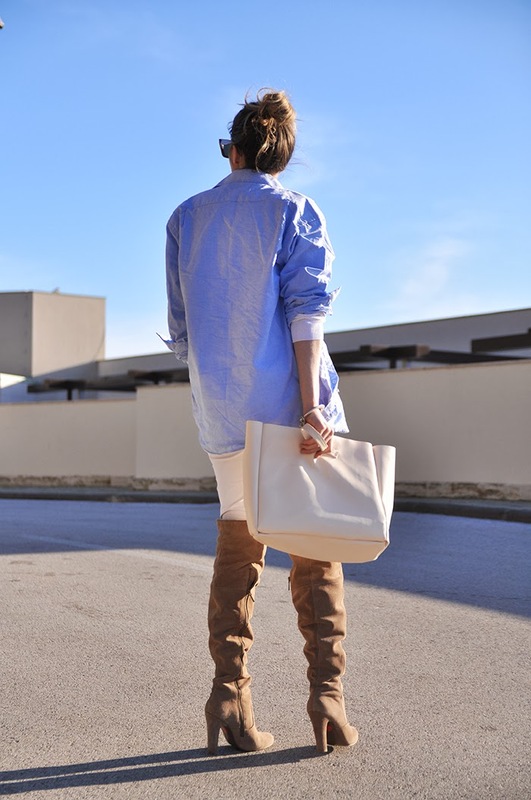 I've been dreaming of an outfit like this for a long time- classic mens button up shirt in a old school blue shade, hair pulled up in a messy bun, simple jeans and last but not least thigh high over knee boots! I'm just in love when classic pieces as a men shirt meet the opposite - the girly ones, and for a messy bun- I just love it, I find it very attractive in the effortless kinda way! Me encantan los outfits con camisas masculinas! estas ideal, las botas son chulisimas! !.